So Erin, you’ve had two shows air on the CW – Significant Mother and Life Sentence (now available to stream on Netflix!). What are your biggest takeaways from seeing those projects through from inception to completion? My biggest takeaway is: enjoy every moment – even the bad ones! [Showrunning] can be such a stressful job, but it’s also such a cool thing to get a show on the air – remembering that can make a huge difference when it comes to your overall happiness. It’s kind of like parenting in that way –some moments are just so hard you feel like they could break you, but if you can rise above that instance and see the big picture of how incredible an experience it is, as a whole, you become inspired to push through with grace. And that’s important, because persistence is a huge part of this career. How does the current political climate affect how you populate the writers’ room, the storylines you choose, etc? I’ve been focused a lot on hope lately because I feel that we’re living in pretty dark times. Gender inequality, racial inequality, socio-economic inequality are so prevalent in our country that it’s easy to get discouraged and create work out of rage, but there is also so much hope in the movements happening to right those injustices and I find that side of things really inspiring. So, I’m choosing focus on that hope in my life and in my work. And in my writer’s room… I focus on gender and ethnic diversity because I feel that TV should represent the complete picture of world we live in. Not just visually, but in the way we tell stories and in the stories we choose to tell. Awesome. You’re also a new mother, something you’re very open about on social media. How has being a parent affected your work? I think being a parent has made me let go of some of my perfectionist tendencies, because it’s just impossible to spend the amount of time I used to spend agonizing over every word I’ve written. I go with my gut a lot more now, and I think my work has benefited from it. Did you see the two-part article about making TV writers’ rooms better for moms in particular? I love that article! I love that people are talking about this because it means change is on the horizon. I would love for every room to follow the Shondaland model. What an amazing example of how a room can be humane and also incredibly impactful. In the two rooms I’ve had for my shows, the moms were definitely my MVPS and I think they deserve way more support across the board. I don’t subscribe to the idea that it’s an issue to have writers miss being in the room for a few hours here or there to attend important events that pertain to their children. We are in the business of showing humanity what humanity is, and the fact that the industry standard prevents writers from having a fully rounded human experience is insane. It’s a narrative designed to keep women down and it’s false. Not to mention the fact that men are parents too and for some reason they are expected to not care about their kids at all because they are men. I know male writers who have been treated worse than pregnant women when they’ve asked to leave a room to go to doctor’s appointment with their wife who is pregnant, because ‘why would they need to be there?’ That’s crazy! Of course they should be there. And what some showrunners don’t realize is that it’s in their best interest to give the people on your staff some grace (whether they are parents or not) because when your staff is happy, they perform better! I swear it’s much less productive to have a writer sitting in a room thinking about how they are missing their kid’s graduation and how devastated their is kid is about it, than it is to let that person go and come back with eight amazing stories about what happened that night. How have you felt supported or discriminated against as a parent in the Los Angeles TV business? In terms of the support and discrimination I’ve experienced personally since becoming a parent… there has been way more support. But it’s all about the situation. When I first got pregnant, I was working for a man who didn’t have kids and it was more difficult to navigate than when I sold a show I created. On that one I was lucky to have a team of male producing partners (all dads) who gave me a lot of support. I had my son while finishing the pilot script, he was on set with me for the pilot shoot, and I was breast-feeding during the entire season of Life Sentence, so support was needed. I had to do certain things on my timeframe (which sometimes meant responding to 80 emails at 3am while night feeding), but it all got done and got done well because I had support. (From my husband also, which was KEY!! I bow down to single parents. Truly could not imagine.) So, it really took a village, but I’m so grateful I had that experience because it let me know that it was possible to do it all if the conditions are right. I will work to create those conditions for other women (and men!) as I move forward in my career as a showrunner. And I think that commitment (from me and countless other showrunners) is what’s needed to make systemic change. Fantastic. Be the change, right? Also – I absolutely adored Life Sentence and was bummed when it wasn’t renewed. So – what is next for you? Did I mention Isn’t It Romantic? will be out in theaters Valentine’s Day 2019? (She did in Part 1 of this interview, but it’s worth mentioning twice!) I’m also currently writing a movie for Disney. 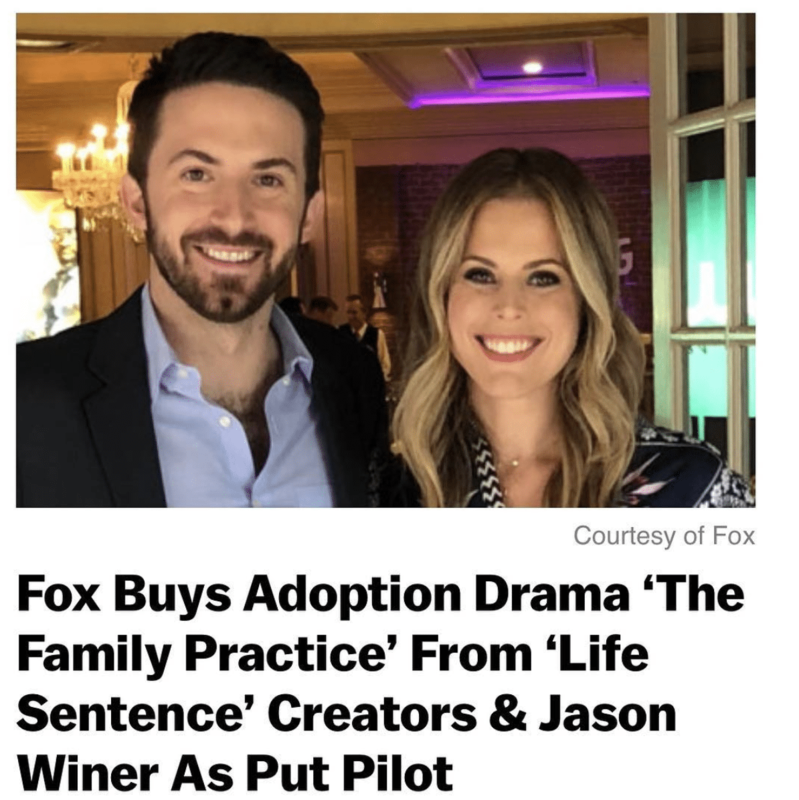 And on the TV side, Rich and I just sold a new pilot to FOX! So, we’ll be writing that this fall, along with developing a few other pilots (for networks TBD). We’re also developing our first feature pitch as a team. Generally, I like to keep a lot of irons in the fire because you never know how it’s all going to play out, so if you need me, I’ll be over here doing a lot of fire stoking. And posting a lot of pictures of my kid on Instagram. Congratulations!! That all sounds amazing. I can’t wait to see your new projects come to life! Huge thanks again to Erin Cardillo for sharing her time and insights into TV and feature writing! Be sure to check out Erin’s Twitter, Instagram, and IMDb pages to stay up to date with all of her latest projects.